Since the end of the July-August brutal war on Gaza, resulting in the slaughter of around 2,200 residents, the Palestinian communities in the occupied West Bank and particularly in annexed east Jerusalem refuse to return to so-called ‘normal’ life under the occupation. During the last few months, hundreds, and on some occasions thousands, of young Palestinians have been taking almost daily to the streets of east Jerusalem to protest against colonial settlement expansion and repression. The protests are also a reaction to a series of nationalist and religious provocations in the Temple Mount /Haram al-Sharif compound by the government and Israeli far-right groups. In parallel there’s also a significant increase in nationalist polarisation in Jerusalem with a renewed cycle of repression and terror attacks. New victims from both sides of the national divide are adding to the death toll almost daily. Just in the past few weeks a 22 year old Palestinian was killed during protests and clashes with the army near Hebron; a 14 year old was killed by an IDF sniper in the Ramallah area; a 12 year old boy was killed by IDF soldiers in the same area. At least 50 Palestinians have been killed in the occupied West Bank since the beginning of the year by the Israeli army and settlers. On Sunday 16 November, Yousuf Hasan al-Ramouni, a 32 year old Palestinian bus driver was found hanged to death at a Jerusalem bus terminal. His family strongly believes that he was the victim of a nationalist attack, while the Israeli police stated that it was a suicide. Two days later, two young Palestinians from east Jerusalem attacked Jewish worshipers in synagogue in the western Jerusalem neighbourhood of Har Nof, killing four. 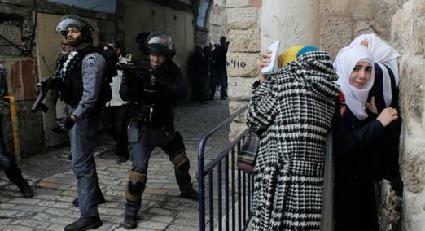 The two attackers and one Israeli policemen were killed in the shoot out. With the background of the horrific death toll of last summer’s war and the growing settlement expansion and land confiscation since then, prior to the synagogue attack there had already been a series of tragic and desperate acts of stabbings and vehicles being driven into people, conducted by Palestinian individuals. These caused the death of six Israelis including a three-month old baby. Last week the continuing protests and clashes in east Jerusalem were accompanied by a wave of rage and protest in the Palestinian communities in Israel that erupted after the cold blooded police shooting and killing of Khayr Hamdan (age 22) from Kafr Kana, an Arab-Palestinian town in the north of Israel. The CCTV footage captured Hamdan banging on a closed window of an Israeli police van after his cousin was arrested due to family dispute. Three policemen got out of the van and shot Hamdan without warning in his back as he was retreating, without posing a threat to anyone. After the shooting, Hamdan was dragged into the police van. A few hours later he succumbed to his wounds in hospital. The following day thousands of Palestinians demonstrated. Tens of thousands took part in a one-day popular general strike, declared by the Supreme Committee of the Arab-Palestinian Citizens of Israel. Many small businesses were shut down. School students went on strike — 2,000 of them also demonstrated in Sakhnin and Kfar Kanne on the day afterwards. Many of the protesters held home-made placards with the writing: “The blame: Arab – The punishment: Death”. Prime Minister Netanyahu reacted to the protests against the police killing by saying: “to all those who demonstrate against Israel and in favour of a Palestinian state, I say something simple: I invite you to move there”. To move where? To make his intention clear, Netanyahu, who opposes the very idea of Palestinian state, ordered the interior minister to consider revoking the Israeli citizenship of those who “acted against the state”. The tragic killing of Hamdan and the shocking CCTV footage led to the protest spreading – though not on a mass scale – from east Jerusalem to the Palestinian communities in the north of Israel. But the causes for the rage are much deeper than that. Almost all of the attacks on Israelis in Jerusalem ended with on-spot killings of the attackers by the police after they were already captured and immobilised. These assassinations without trials were fully backed by the head of the police and the government ministers. Internal Security Minister (responsible for the police) Yitzhak Aharonovitch praised the police killings saying that he wishes that any act of terror will end with the on-spot death of the attacker. This was obviously referring only to Palestinians, as Jewish terrorists that attack Palestinian communities go mostly unpunished. A week before Aharonovitch’s statement, a five year old Palestinian girl was killed in a hit-and-run incident by a settler in the West Bank. He was freed immediately after a short police questioning, though it cannot be ruled out that the running-over was intentional. In contrast to that, after Hamdan was murdered by police he was immediately tagged by Netanyahu’s government ministers as “terrorist”. While Netanyahu’s spokes persons give highly publicised orders to demolish homes of families of Palestinian terror suspects without any trial and conviction, no such steps were ever taken against Jewish terrorists, including after the recent murder of Mohammed Abu Khdeir in Jerusalem. Those acts are another attempt by the Israeli regime to consolidate an image of military supremacy against the developing discontent on the ground. The recent declarations of more settlement expansion and building of hundreds of new housing units in east Jerusalem aim ultimately partly for the same goal. At the end of October, the prime minister’s office announced it was moving ahead with plans to build more than 1,000 new homes in the Ramat-Shlomo and Ar-Homa settlements in east Jerusalem. The aim of those plans is to consolidate even further the annexation of east Jerusalem and shut the door on any prospect for a Palestinian state with a capital in east Jerusalem. There is no doubt that those declarations encourage far-right and other settlers’ groups. In the last month they managed to take over tens of houses in the Palestinian impoverished neighbourhood of Silwan – an act without precedence in the last 20 years. The takeover of the houses was done with the support of a big presence of riot police and border police and celebrated publicly by government ministers. The minister of housing, Uri Ariel, from the settlers-based racist party ‘Jewish Home’ even declared that he is going to move to one of the houses. The expropriation of Palestinian families in Silwan, that is just a few miles away from Jerusalem’s holy sites, comes along with the provocative tours by the same settlers’ groups in Haram al-Sharif/Temple Mount. The declared aim of the tours, that reached an historic peak during last September’s Jewish holiday season, is to “reclaim” the already occupied and annexed compound of the Al-Aqsa mosque. Far-right members of the Knesset (Israel’s parliament) and government ministers take part in these tours almost on a weekly basis accompanied by riot police in full gear. Those are acts not only of religious but also nationalist provocation, that raise the threat of further restrictions on Muslim worshipers in the compound. The recent protests and clashes in and around the compound led even a senior official of the Israeli police to admit: “Repeated attempts by members of the Knesset to reach the Temple Mount are a provocation that incites Palestinians”. But this official obviously turned a blind eye to the provocative policy of the police force itself frequently restricting the entrance of Muslim worshippers as an act of collective punishment. This goes hand in hand with other forms of collective punishment against Palestinian neighborhoods, villages and refugee camps in the Jerusalem area in the recent weeks. These include: new restrictions of movement and closures, house demolitions and draconian fine and traffic tickets on the impoverished population issued by the municipality. This comes after almost five decades of systematic discrimination and criminal neglect of infrastructure, and lack of schools, housing and jobs. The levels of poverty (78%) and unemployment (40% for men, 85% for women) have now reached the highest point since the start of the occupation in east Jerusalem in 1967. On top of that, physical attacks and terror acts against Palestinians by organised far-right groups and individuals, including the horrific kidnapping and murder of 16 year old Mohammed Abu Khdeir by Jewish terrorists last summer, are not ceasing. 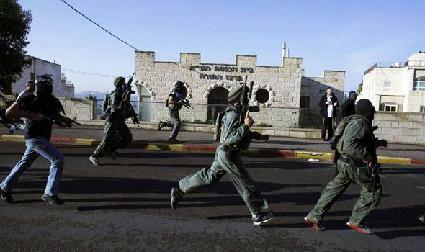 In the past few weeks two mosques were set alight in the West Bank. Though there’s a growing fear among the Israeli establishment that the situation is spilling out of their control they also feel growing pressure to show force against any attempt of the Palestinian masses to challenge the status-quo. With this background, disagreements on tactics and strategy between the different heads of the police, the army, the secret service and the government are becoming more evident. The answer of Netanyahu’s government to the growing discontent is more repression. Since the start of the Gaza war around 1,000 Palestinian youth have been arrested in the area of east Jerusalem, many of them minors, including 10 year old children. The government is cynically playing on the yearning of the Israeli residents of Jerusalem for security and stability, while spilling more fuel on the fire it started. With a promise to “restore calm” the government ordered a deployment of 1,000 additional policemen to annexed east Jerusalem, 2,500 troops to the occupied West Bank and increased police presence around the Palestinian communities in Israel. In addition to that Netanyahu ordered more house demolitions, fining the parents of children involved in stone-throwing, and banning organisations in Jerusalem that encourage “incitement”, i.e. 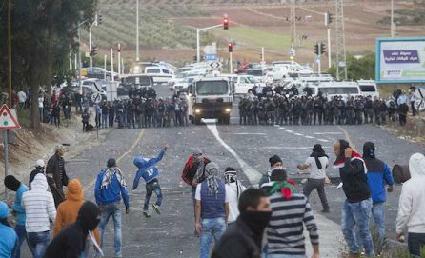 any form of struggle against the occupation. Taking into account the horrific conditions on the ground and the arrogant opposition of Netanyahu’s government to any significant concessions in the West Bank or Gaza, it seems that a new uprising on a mass scale – a third intifada – is just a matter of time. Some commentators in the Israeli media already refer to the recent events as a new intifada or “silent intifada” or “urban intifada”. In some cases it is done deliberately to spread fear among the Israeli public and put pressure on the government ‘to do something’. But it needs to be stressed that the current protests are not yet on a mass scale and therefore it’s not yet an intifada in the true sense of the meaning – a mass uprising against the occupation and national oppression. However, this kind of uprising is absolutely necessary to stop and reverse the arrogant and brutal policy of the Israeli regime. Among the obstacles to that are the arrests and intimidation that aim to dismantle any form of local leadership that can lead struggles in the Palestinian communities in east Jerusalem and beyond. The Fatah-led Palestinian Authority makes no effort to overcome this obstacle. Its policy of ‘security cooperation’ with the Israeli army means holding back and suppression of protests. One of the senior officials in the office of PA leader Mahmud Abbas explained the twisted logic behind it: “We’re going to the UN to ask for a state. We cannot afford the West Bank and Gaza to look like Somalia with armed and masked men everywhere, because the world will not listen to us”. 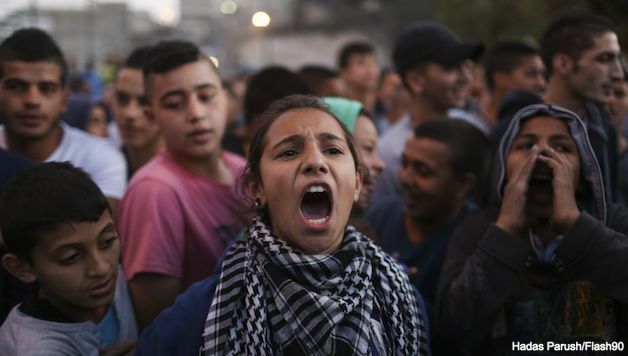 Hamas on the other hand declared a few symbolic days of rage in the West Bank but without the ability or the will to mobilise wider layers for an effective, prolonged, struggle. The main concern for the Hamas leadership is stabilisation of the situation in Gaza through reaching new arrangements with the Israeli regime on the one side and the Egyptian regime on the other, via Fatah. The difficulties in the current situation are clear. The recent war on Gaza exposed the limitations of Israel military power, but it also showed that the military balance of forces is clearly on the side of the Israeli war machine. On the other hand there’s also a clear limitation to PA diplomatic campaigning. The recent symbolic recognitions of a Palestinian state by different European governments may help to expose the policies of the Israeli regime but they don’t change anything on the ground. This impasse can lead to more counterproductive, desperate acts but also to bigger openness to new methods of struggle and new political forces potentially emerging on the left. Mass and semi-mass demonstrations in the occupied Palestinian territories can win an immediate solidarity worldwide, and potentially reignite the revolutionary struggle in the region, particularly in Jordan and Egypt. It can also change the outlook and win support from a significant section of Israeli society. Recent polls show that support for Netanyahu’s government policies is far from solid. According to a ‘Peace index’ poll conducted in early November, 64% of Israeli-Jews consider that the main reason for Netanyahu’s decision to renew the building in the settlements was to “shore up his status on the right and among the settlers”. When asked: ‘What is the right way to prevent terror attacks?’, both a majority of Jews (52.5%) and Arab-Palestinians (81.2%) in Israel stated that “the peace talks should be renewed”. The socialist left in Israel should strive to widen further the cracks in the government’s support that started to re-emerge with the end of the Gaza war, especially given the background of deterring economic conditions, and explain the need to build a working-class led movement in Israel that can put forward a socialist way out of this perpetual crisis that is in the interests of all the working people in the region. The high support for renewal of the ‘peace talks’ among Israelis is another indication of dissatisfaction with Netanyahu’s government. But it has to be stressed that real peace talks would be possible only with the ending of the occupation, the siege, the settlement project and all other forms of exploitation and oppression of the Palestinians. This will be impossible without a struggle. The current stage of struggle poses the urgent need for setting up democratically elected popular committees in the Palestinian communities to plan further actions, mobilise the wider layer of workers and youth and organise effective self-defence, including with arms in hands against Israeli army lethal repression and settlers’ attacks. Those committees can generate discussion in all levels of society on how to take the struggle for national and social liberation forward. • An independent investigation into the killing of Hamdan by representatives of the community, workers’ organisations and the wider public. For democratic control over the police, subjecting them to democratic supervision by community policing committees. • Establish democratically elected action committees in communities where demonstrations are taking place in order to assist with organising the struggle. • Remove the army from the Palestinian territories! End the occupation and the settlement enterprise. End the siege policy on Gaza. • For an independent, democratic socialist Palestinian state, alongside a democratic socialist Israel, with two capitals in Jerusalem and equal rights for minorities, as part of the struggle for a socialist Middle East and regional peace.